The buckthorn isn’t very well known, and it is mistaken for the alder buckthorn (Frangula alnus), or the other way round. They grow on dry alvars in northern and western Estonia, there they are seen more often than elsewhere. Despite the “puu“ - tree - in its Estonian name, türnpuu, the buckthorn mostly grows as a dense shrub. The characteristic thorns sticking out at the tips of the branches become nicely visible as autumn advances. 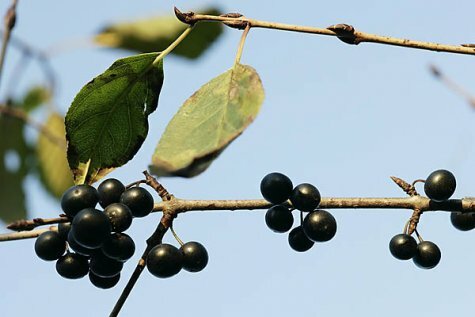 The fruits are berry-like, small black drupes with two up to four seeds. The taste is bitter-revolting and they are slightly poisonous. 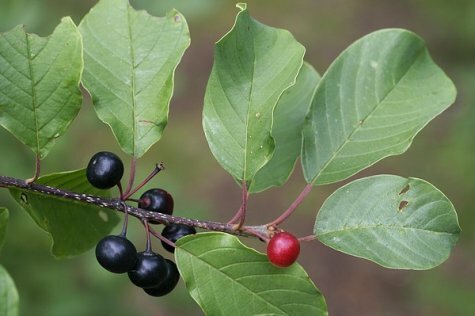 The alder buckthorn fruits are quite toxic compared to the buckthorn, and a part stay reddish, not going black: compare the photos. Leaves are quite similar, and on the north-western coast they sometimes grow side by side.